Image Credit: Dorothea Rust. laut end gleise (das floos). 2014. Photo by Frederic Meyer. 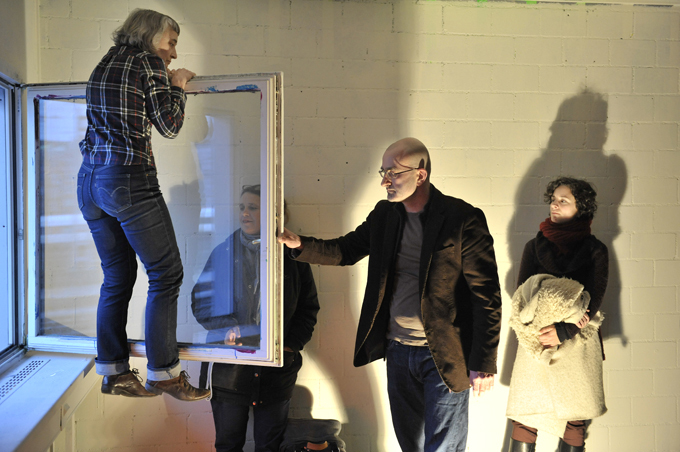 Dorothea Rust works in/with dance, improvisation, performance art, live actions, and installation. She is the curator of a diverse range performance events in collaboration with other artists including Der Längste Tag/The Longest Day (an annual 16-hour event of non-stop performances) and music groups like GNOM gruppe für neue musik baden (group for contemporary music). She attended the Zurich University of the Arts graduating with a Degree in Visual Arts Studies (2003) and a Masters in Advanced Studies in Cultural/Gender Studies (2006). From 1983 to 1991, she worked in New York City collaborating with other dancers, choreographers and musicians where the experimental spirit (and some of the key players) of the Judson Dance Group of the 60s were still present. She took training programs in Classical Ballet, Limon Technique at the Limon Center, Cunningham Technique at the Merce Cunningham Studio, Contact Improvisation, Improvisation & Composition, Releasing Work, with various artists and teachers such as Alfredo Corvino, Eva Karczag (member of Trisha Brown-Company), Dana Reitz, Deborah Hay, Elaine Summers, Simone Forti, members of the Meredith Monk Company and others. Her performance work has been presented in performance art, dance and gallery contexts in festivals and other events in Switzerland, Canada, Chile, India, and Israel; an dyer dane work has been presented in Philadelphia, Washington and New York City (St. Mark's Church, Knitting Factory, P.S. 122), Germany, Portugal, Finland and more. Recent work has been presented at BRISE°3 Performance Art Festival Flensburg/Augustenborg (2015) and KIPAF Kolkata International Performance Festival India (2015).